As the name indicates, electrotextiles are textiles with electrical properties. They’re mostly used for electromagnetic shielding, anti-static and heating purposes, and also for soft circuits: electric circuits or sensors made out of a combination of special fabrics, threads, yarns and electronic components. 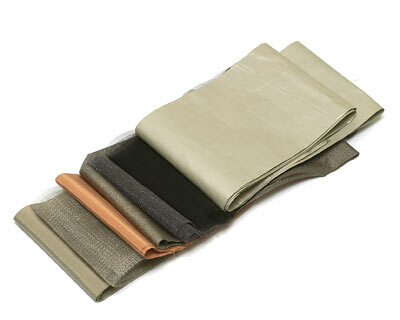 Fabrics with electrical properties made by blending or coating textiles with copper and/or nickel and/or silver fibers. They’re available in many textures, weaves and combination of materials. Stores such as Plug & Wear, Mindsets and Less EMF sell kits with a sample of each of their conductive fabrics. These samples provide an excellent way to get a hands-on feel for and test the properties of each material in order to find the right one for your project before acquiring it in a larger quantity. 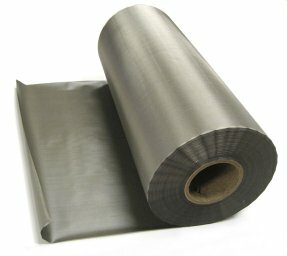 There are many types of conductive fabrics and you can find an extensive (though not comprehensive) list on the oM wiki. Here I will only describe some of my favorites. :: Shieldit Super (iron-on conductive fabric) from Less EMF: a single side conductive fabric made of polyester substrate, nickel and copper. The back side is covered with a non-conductive hot melt adhesive, which activates at 130ÂºC (266ÂºF), meaning that it can be ironed on to another fabric, wood, glass or paper. 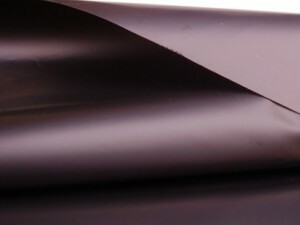 This fabric is a pretty good conductor, easy to apply and thus perfect for making longer connections between components. It can also be cut and sewn like ordinary fabric. 230 g/mÂ², 0.17 mm thick. UL 94V-0 level flame retardant. RoHS Compliant. 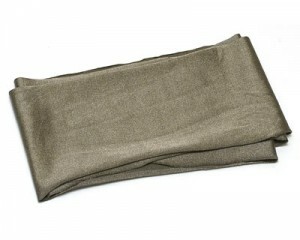 Gray, 14 inch wide. :: Electrolycra from Mindsets: looks and feels like ordinary lycra but it’s highly conductive. Its conductivity in one direction depends on how tightly it is stretched – if you pull it the resistance increases and then drops again when stretched even tighter. When cut into a thin strip, the material also warms up when current is passed through it and can thus provide the basis of a heated garment. A 6V battery will cause an appreciable warming effect. Resistivity: 5 ohms per 100mm, increasing to 20 ohms when stretched to 150mm. If the material is turned through 90Âº and stretched the resistance drops to 2.5 ohms. :: Knitted Superlight Conductive Fabric from Plug & Wear: an extremely light and transparent conductive fabric, only 190 g per sq.m. It allows air flow and is easy to cut with scissors. It can also be sewn with a standard sewing machine or soldered to. Hand washable. Material: tin copper. Resistivity: 0.1 Ohm per square. Width: 1000 mm (39″), thickness: 1 mm (.039″), max working temperature: 150Â°C (302Â°F), weight: 190 g per sq.m. :: Conductive Aluminum Laminated Fabric from Plug & Wear: a single side conductive (the shiny side) laminate made of aluminum foil and fiberglass reinforced polypropylene tape. It’s easy to cut with scissors and it can be sewn with a standard sewing machine, but it’s very stiff and calling it a fabric is a bit of a stretch. In fact it feels a lot more like a thick aluminum foil which makes it perfect for paper projects. In a recent openMaterials workshop, a group of students cut it into an beautifully intricate shape and used as a touch sensor on the cover of a book. Width: 650 mm (25.5″); thickness: 156 micron; max working temperature: 45Â°C (113Â°F); weight: 185 g per sq.m. Conductive threads are made of a combination of either cotton or polyester with alloys of several conductive materials such as silver, copper, tin and nickel. 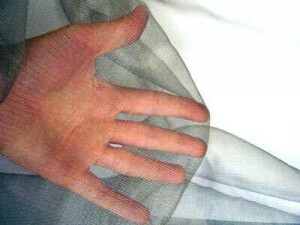 Just as most conductive fabrics, conductive thread is uninsulated making it excellent to connect electronic components to each other or to other electrotextiles. In order to ensure proper connection it should be sewn very tight and with more loops than normally used with regular thread. After some time, conductive thread tends to fray and the stitches to become loose. For this reason I often coat my conductive thread connections with a bit of Wire Glue. Wire glue takes several hours to cure so this coating should only be done after you’re done with all the sewing. There are several kinds of conductive thread, with significant differences in terms of conductivity/resistivity and fraying, but they are commonly sold in two qualities: 2-ply and 4-ply. The 4-ply contains twice as much metal as the 2-ply, making it more conductive, but it’s also thicker making it harder to thread and sew with. For this reason I usually keep a set of sewing needles with large eyes. The How to Get What You Want and Fashioning Technology websites have some excellent overviews and comparisons of the conductive threads available in the market. The resistivity of all conductive threads increases drastically with length, making them inappropriate for long connections. For this reason, consider making long connections with ribbons of a good conductive fabric and using the thread only to sew the electronic components to the conductive fabric. The highly resistive (<1000 Ohm/10cm) silver plated thread offered by Less EMF (cat. #A1226) is good for embroidering fixed or variable resistors. 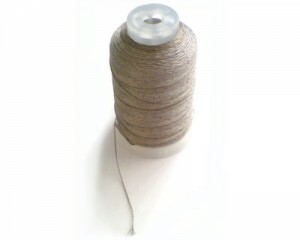 Conductive yarns are usually made of a combination of polyurethane and inox steel fiber. The resistivity of some yarns increases when the knitted piece is stretched. Again, see How to Get What You Want for great information on conductive yarn. 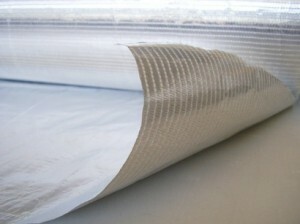 :: Textile Perfboard: a fabric base with interlaced rows of thin metal wire. :: Pressure and Bend Sensitive Fabrics, Tapes and Buttons: made of a layer of insulating knitted or resistive fabric sandwiched between two layers of knitted conductive fabric. :: Textile Water/Wetness Sensor: detects water by changing its resistance from an open circuit to a few megaohms. :: EL Wire Tapes: knitted tapes with strands of EL wire weaved into them. :: Hook and Loop Fastener: similar to velcro but conductive. :: Wire Glue: even though originally created to replace solder on the connection of electronic components, wire glue is a great material for working with electrotextiles as well. I use it to coat conductive thread knots to prevent them from fraying and also to attach metal snaps to metals that can’t be soldered to. :: EL Wire: can be basted, woven into or otherwise applied to your soft circuits for illumination. :: Quantum Tunnelling Composite (QTC): an interesting pressure sensitive material for making textile control pads and keyboards. :: Metal Sewing Materials: almost all metal sewing supplies, such as snaps and zippers, are conductive and can be used in conjunction with electrotextiles. See oM’s connecting hardware & softwear on soft(er) circuits blog post for some examples. :: SMD Components: SMD battery holders, LEDs, etc that have flat metal pads are also great for soft circuits. You can solder or wire glue metal snaps or metal rings on these pads to attach them to your circuit. * Most electrotextiles stores sell conductive fabric sample kits, you can just try one of those instead of buying a larger quantity of the stretch and non-strech conductive fabrics. There are many resources for learning how to use electrotextiles. One of the most useful and complete, from a materials and experimentation point of view, is Kobakant’s How to Get What You Want – make sure to check out the sensors and conductive materials sections. If you’d like to contribute content or corrections regarding electrotextiles, please use the comment form below. and we are developing a high visibility coat for working in dangerous-freezing condition. We install a micro computer into the coat and want to integrate into the cloth circuits capable of carrying 5 volts, 1 amp (ish) 3 meters around the cloth. Any ideas; yarn or pre wired cloth at first we are looking for a small sample (to buy , how much?) about 10m long. Hi Paul. That sounds like a fantastic project! You may try yarn, but it’s not very easy to come by. I suggest stranded soft wire that you can baste onto the jacket. As for samples and buying: Open Materials is strictly an informational website, we do not sell any materials. I suggest you contact the manufacturer directly.